Loosen the CANNA Terra Professional and fill the pots, compressing the medium slightly. Add water until a little begins to drain through and then place the plant in the CANNA Terra Professional. Depending on the size of the pot, growing conditions and the plant's growth stage, adjust the amount of water given to the needs of the plant in question. Under normal conditions, adult plants evaporate 4-6 litres of moisture a day, per m2. For larger plants, use 5 litre pots or larger. The larger the pot, the more constant the root environment will be. If you use run-to-waste, make sure that there’s sufficient drainage; you may want to place a thin layer of hydro-granules in the bottom of the pot for air and drainage. CANNA Terra Professional is a product, homogenous in structure, natural and free of harmful viruses and soil diseases. CANNA Terra Professional has a complex water/air system that creates conditions ideal for virtually every form of cultivation. 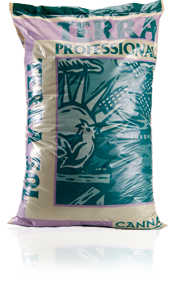 After use, CANNA Terra Professional makes an excellent potting mix improver. CANNA Terra Professional's plastic packaging material is 100% recyclable.